It is very important to note, right at the outset, that the International House of Philadelphia is not a part of the University of Pennsylvania. That begin said, International House is very important to the University of Pennsylvania campus and community, and it has been so historically. If one looks at the dates mentioned at the beginning of the succeeding sections on the Office of International Programs, one will notice that that office was created in 1949. Its campus predecessor was the Office of Inter-American Activities, which had been created in 1946. But a concern for the welfare of international students at the Penn campus began long before these offices existed. The group of people who ran an institution for that concern, which began informally in 1908 and formally in 1910, was the Reverend A. Waldo Stevenson, Edward W. Cope and the Christian Association, clearly forty years before Penn created an office to deal with similar issues. In 1908, the Reverend A. Waldo Stevenson was walking through the Penn campus and ran into a group of Chinese students. He spoke with them and was astonished that he was, apparently, the first American to befriend them. Taken aback and intrigued, the Reverend and his wife began to invite foreign students from Philadelphia colleges into their apartment every Friday night and entertain them (one such gathering is pictured above). He continued to do this for many years, even after 1910, when the Christian Association of the University of Pennsylvania was presented with the issue and consequently decided to take it on, under persuasion from Edward Cope Wood. In the 1911-1912 academic year, Stevenson became the Foreign Mission Secretary of the Christian Association, and by the next year was devoting all of his time to the foreign students at the University of Pennsylvania. Not many years later, the Christian Association, with suggestions from Stevenson and Wood bought the property at 3905 Spruce St. from the Potts family. 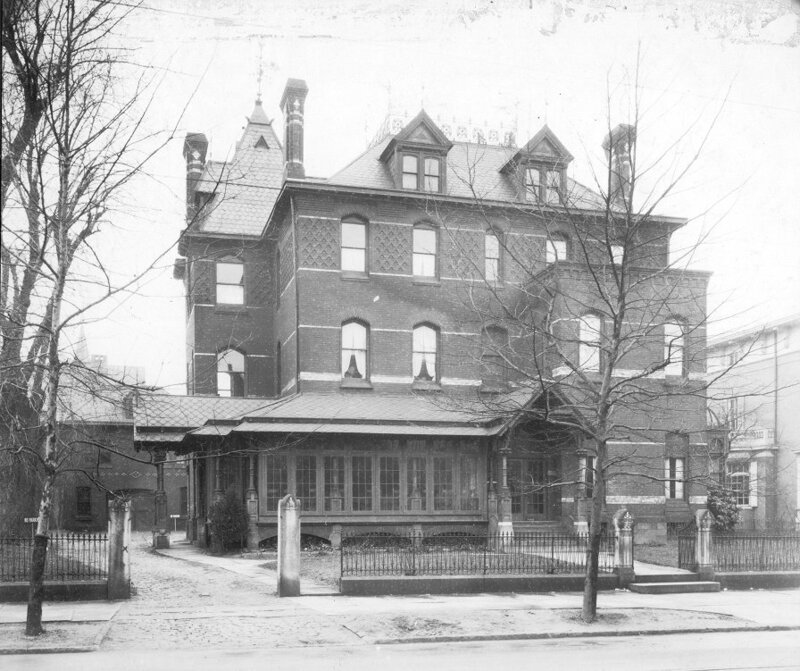 In an article from The Register dated June 25th, probably from 1917, it was stated that Mr. Potts (who was also a member of the Board of Trustees at the University of Pennsylvania) had originally bought the property for $100,000, but he was “so impressed with the idea that he sold the old mansion… for $20,000.” On New Year’s Day, 1918, 3905 Spruce Street (pictured at left) officially opened its doors under the sponsorship of the Christian Association as a Home for Foreign Students, which came to be known as the International Students’ House and Stevenson became its first director. 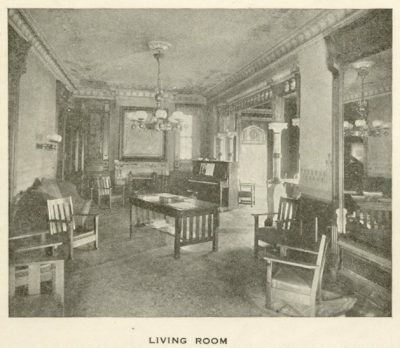 The building at 3905 Spruce Street was to have a lounge on the first floor as well as a reading room, a dining room and fifteen living rooms on the upper floors (living room, c. 1917, pictured at right). Although the location contained no living facilities, it did provide a number of services to foreign students in Philadelphia, predominantly those at the Penn campus, if for no other reason than its location. There were counseling and information services for a host of problems foreign students might encounter, including language, financial, health and diet, immigration and technical problems as well as maladjustment to living in the United States. It was also used for recreation and leisure, as lounges had radio, phonograph and television facilities and there were game and reception rooms. The International Students’ House also provided for programs including forums, debates, lectures, panels and planned trips and outings as well as weekend activities such as dances, films and game nights. Also, for the next thirty-three years, the International Students’ House would be sponsored by the Christian Association of the University of Pennsylvania. incorporated International House as an independent center. The incorporators, who also became members of the Board of Trustees of International House, were selected from the Trustees of the Christian Association. In the fall of 1943, International House was taken into the United War Chest and thus received community support for the program. Zimmerman believed in this philosophy. Zimmerman was given more responsibilities after the Director, Elmer T. Thompson, unexpectedly died in 1950. He became the new director, and due to a lack of funds, had only one other assistant director who was in charge of programs. The decline of funding continued, and in 1953, Zimmerman lost that help as well. He was put in charge of three huge responsibilities: administrative, financial and programs. His only help was a single hostess. His report, as already mentioned, was dated 1957. It was a plea for the Board of Trustees to expand programs so International House could grow, attract more attention, and so attract more funding. Of course, the number of foreign students in the Philadelphia area had only grown throughout the years. From 1940 to 1954, the number had more than doubled. Zimmerman reported that before 1940, there were usually no more than five hundred. In 1954, there were about twelve hundred. 3905 Spruce Street had also become too small for the needs of the International House programs. Many times, programs happening at International House were not expressed to the public through the media if only for the reason that International House at that location had no room for those that would show up if they did so. Zimmerman was on the tip of a double-edged sword. He needed to gain the public’s attention to fund programs at International House and get more contributors to keep the programs alive, but if the public was made aware of all the programs going on, how could they attend them and become interested if there was simply no space for them to do so? The answer came in 1959, two years after Zimmerman’s report to the Board of Trustees, when International House moved its location from 3905 Spruce Street to the former Whittier Hotel located at 15th and Cherry Streets (pictured at left). 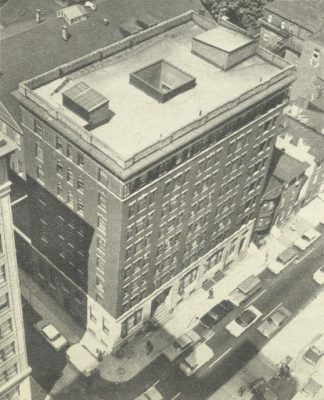 The Whittier Hotel had been lent to International House by the Society of Friends, but in 1965, the old hotel was scheduled for demolition, as the portion of 15th street above Arch St. was widened. Once again, International House had to be moved to a new location. That new location began to be built in the late 1960s, virtually on the Penn campus. It would become an extremely welcome return. 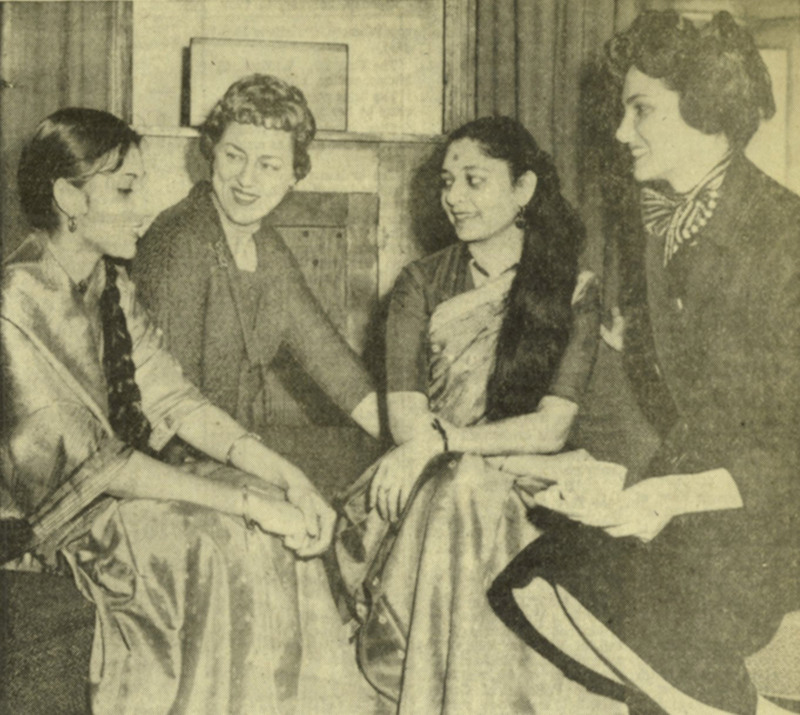 During the time period at the Whittier Hotel, though, the International Festival Ball continued, an event that became annual and this present year celebrated its 48th Anniversary. when the International House moves back on campus with its new building, a great step forward will be taken in the university’s community ability to handle the non-academic problems of the foreign students. While the International House is not exclusively for the use of University of Pennsylvania students, its location at 37th and Chestnut Streets will make it an integral part of the campus. It would be unfortunate indeed not to coordinate the university’s foreign student program with that of the International House… Presumably when it moves back on campus it will be drawn more heavily into university activities. [o]ne of the programs built into the new International House is the deliberate mixing of foreign and American students. Interestingly enough this innovation is in the domain of foreign student management where the University’s primary concern should lie. So far, at this University as elsewhere, foreign students services have been aimed at meeting the special needs-personal as well as academic-of the foreign students themselves, while very little has been done to maximize their usefulness in creating an international climate on the campus. It should be emphasized that the University’s interest in foreign students is only partly in solving their problems, it is also in using their presence to internationalize our own campus. With International House moving back to Penn campus, the internationalization of the campus could only progress, it was surmised. Richard Lambert was correct. Its move back to the Penn campus made possible everything that was expected. That new location was built and opened at the end of 1970 at 37th and Chestnut Streets. (pictured at left). The funding for the building of the new International House totaled $8.5 million (adjusting for inflation, that amount would be over $45 million today), and came from three main parties. They were a $5 million grant from the Haas Community Funds was endowed by Mr. Otto Haas, $1 million from the community and a $2.5 million interest loan from the Department of Housing and Urban Development. Still, International House remained a non-profit organization. The new building was twelve stories tall and had been designed by the Philadelphia architectural firm of Bower and Fradley. At its dedication ceremony in late November, 1970, the address was given by the Honorable Marietta Tree, who was the former United States delegate to the United Nations. 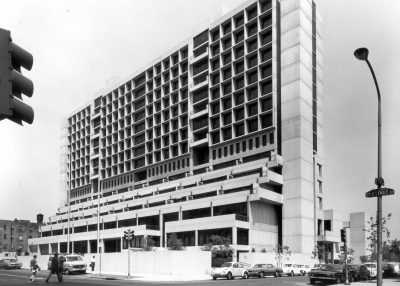 Also, in 1986, International House became “the first building in Philadelphia to convert from steam power to a cogeneration system… utiliz[ing] the same fuel for two different operations.” These operations were electricity and heating. This new energy plan was a $900,000 project and by doing so, International House intended to save $200,000 annually. Prior to 1986, an energy bill at International House was reaching a half of a million dollars. [r]esidents have several shared theories about why I-House people live together so well. First, it’s a commonly-held belief there that nations cause wars, not people… And they see that the politics of an “enemy” nation is not the responsibility of its citizens, who are powerless to regulate political activites. And so most people are able to deal with one another as people, rather than as representatives of any nation. 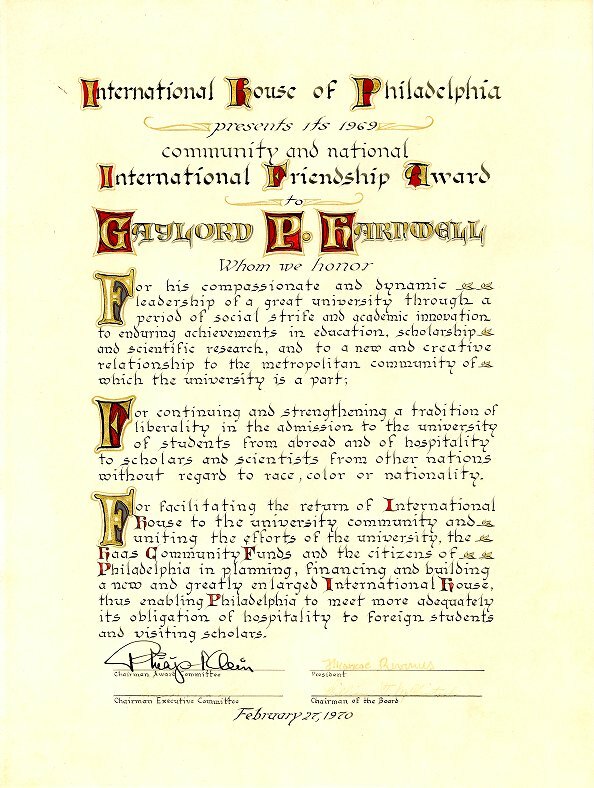 Penn President Gaylord P. Harnwell had the distinguished honor of being awarded the International Friendship Award for the year 1969 on February 27, 1970. 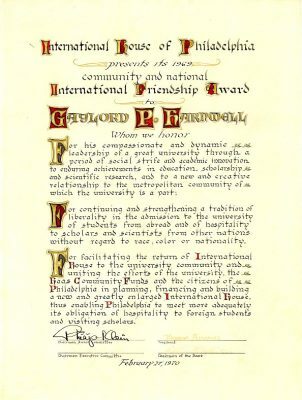 The award, shown at left, expressed the gratitude of the International House family towards the Penn president. To this day, the International House of Philadelphia has been considered a hallmark of the Penn campus, even if it’s not officially a part of it. It should be noted, though, that recently the Office of International Programs, the next subject in this report, moved its location from Bennett Hall to International House. One believes that the strong links the Penn community and International House have had in the past will only become greater over time, and only good things can come of it, as only good things have in the past.